The Muppets perform Queen's "Bohemian Rhapsody"
While the lovable felt monsters of Sesame Street celebrate their 40th anniversary this year, Jim Henson's other creations, the Muppets, have been largely out of the spotlight. Let's be honest: the last time most people have seen a Muppet was in a TV commercial (and even then, it was Kobe and Lebron, not Kermit and Miss Piggy). That changed this week with an assist from Queen's songbook. The puppet ensemble released a cover of the classic Queen anthem "Bohemian Rhapsody" to commemorate the death of Freddie Mercury 18 years ago. Whether it's Muppet nostalgia or a love of rock ballads, the video clearly struck a chord: it's had some 7 million plays in just a week's time. 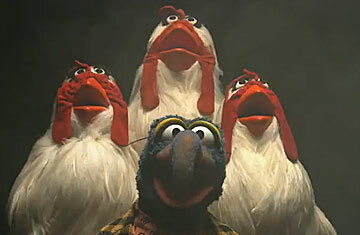 It's not the most faithful of renditions: the Muppets do gloss over some of the song's racier lyrics. "Mama, just killed a man/ Put a gun against his head/ Pulled my trigger/ Now he's dead" becomes a monosyllabic riff ("Mama! ... Mama?") by the drummer Animal. But these are kids' show characters, after all, and by the time Miss Piggy finishes the song with an epic solo delivered atop a piano, the few omissions seem like a trifling complaint. The video, an official production of the Muppets Studio, is the puppet clan's first foray into covering music on the Web (Beaker's solo "Ode to Joy" notwithstanding). With all the buzz for its release, it's a safe bet that more videos will follow. "Bohemian Rhapsody" is a tough number to top, but who wouldn't want to see Henson's creations stretch a little with, say, a "Thriller" cover? It's a YouTube franchise in the making. See the best Disney animated movies.